Up to four people believed dead in Esperance bushfires. Four dead, fears for two more in bushfires near Esperance in Western Australia. Four people have died and there are fears for two more in bushfires burning out of control near Esperance on Western Australia’s south coast. Fire and Emergency Services Regional Superintendent Trevor Tasker said the blaze at Salmon Gums was the worst he had ever seen. Two of those killed are believed to be a farmer and one of his workers from Salmon Gums. Superintendent Tasker said they were thought to have crashed a car while trying to flee from their farm. “We believe that may be the case, but we really can’t say for sure,” he said. “All the elements lined up,” he said. “You could see the smoke coming over hill, and the panic was setting in. There are four fires burning in the region, but the two most serious are at Grass Patch and Salmon Gums, 100 kilometres north of Esperance and at Stockyard Creek, 25 kilometres east of the town. Crews are on the scene but have not been able to stop fires burning out of control. “It’s just devastating. You know, the bizarre range of feelings that you have”, he told ABC News 24. “The kids are crying. You’re chucking all the things in the car like you can think of, like favourite teddy bears and looks – our accounts and photo albums, but it’s a pretty scary experience for the family. 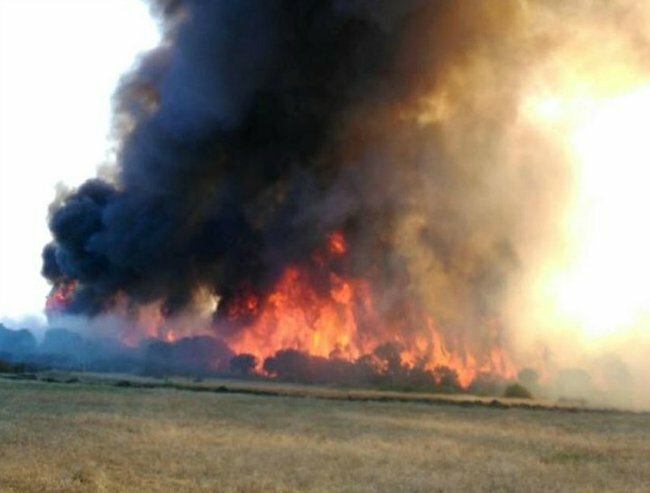 The Department of Fire and Emergency Services (DFES) said all available resources in the town were fighting both blazes. Two smaller fires are also burning at Thomas River and Mt Ragged in the Cape Arid National Park, but they are not threatening property. Primary schools at Scaddan, Grass Patch and Salmon Gums are closed today. DFES said people in Stockyard Creek and Mullet Lakes in Merivale in the Shire of Esperance needed to act immediately to survive. They have advised people to leave now for a safer place if the way is clear, and that “leaving at the last minute is deadly”. “If your plan is to stay and actively defend, do not rely on mains water pressure as it may be affected,” a DFES statement said. “If you have access to a water tank and plan to defend your home, start patrolling with your hose and put out spot fires. “If you cannot leave, you need to get ready to shelter in your home and actively defend it. Smoke from a bushfire billows close to houses in Cairns Parade in Le Grande estate in Esperance. Image via Facebook: Karly Humphrys. DFES Chief Superintendent Murray Bawden said there were reports of three homes being lost in the fires. “Hundreds of local firies and dozens of appliances are going to be working tirelessly for the next three to four days to contain these fires and at this stage we’ve got reports of potentially three homes lost and we’re continuing our efforts,” he said. Mr Bawden said expert teams were en route from Perth to the affected areas. “Experts in rapid assessment and fire investigation [are heading to the affected areas], so as soon as we get some real data our first priority will be to discuss with the community and families if necessary and the greater community,” he said. Mr Bawden said weather conditions today were much more favourable than yesterday. “The key thing for us is the fire’s now come out into an accessible area largely in the paddocks and across the pastoral lands,” he said. 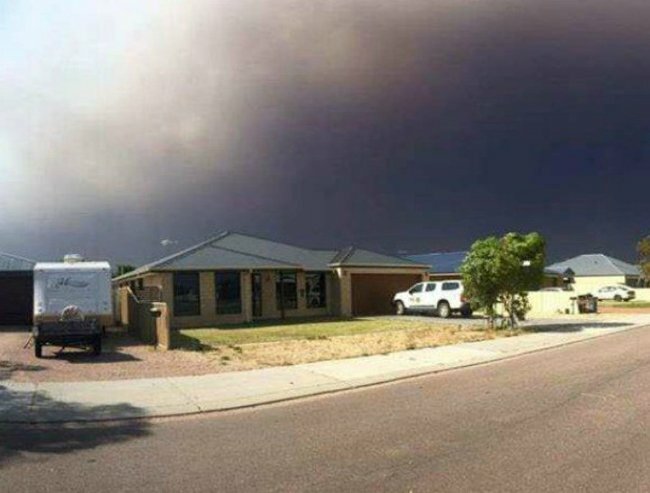 Esperance Shire President Victoria Brown said two evacuation centres were set up yesterday, however people have now been moved out of the one at Salmon Gums as it is no longer safe. “One of them yesterday was set up at Salmon Gums, north of Esperance, and the other was the Civic Centre,” she said. “We didn’t have anybody at the Civic Centre last night, though I gather a few people have started to come in. “Most locals coming to town would either have their own accommodation or friends that would be able to put them up. Ms Brown said it would take between three and five days to control the fire. “After that we are going to have a very long recovery process,” she said. “This is going to have a massive impact on our community. “We’re expecting huge property damage and stock losses. “We are urging people today to please avoid the fire area. There are power lines down there are roads closed. Onshore Cafe Esperance employee Joy Forster said more than 100 people had flocked to Esperance following evacuations, with others fleeing north to Norseman. “There’s been lots of smoke around town,” Ms Forster said. The fires were started by lightning strikes.